Could this ward off cancer and heart disease? An advertising campaign highlighting the health benefits of tea was guilty of exaggeration, a watchdog has ruled. The Advertising Standards Authority criticised a UK Tea Council poster which recommended drinking four cups a day as part of a healthy diet. The council said its campaign that tea was rich in beneficial antioxidants also found in fruit and vegetables was backed by scientific papers. But the ASA said there was no evidence to "firmly substantiate" the claims. The watchdog also criticised the UK Tea Council for making reference to the government's campaign to encourage people to eat at least five portions of fruit and vegetables a day. The poster read: "Five portions of fruit and veg plus four cups of tea. It all adds up to a healthy diet." The ASA said the reference could mislead readers into thinking the poster was linked to the government's health drive. 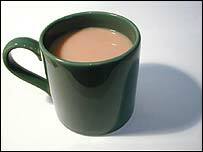 An independent expert who advised the ASA said evidence about the health benefits of drinking tea was "promising but inconclusive". He said that while there was some scientific evidence that tea may protect against cancer and heart disease, the findings had yet to be confirmed in tests on humans. The UK Tea Council said tea was rich in plant-derived antioxidants called flavonoids - and scientific papers had proved the drink could have a significant impact on health. It also dismissed any suggestion that its advert had implied that tea could be a substitute for eating fruit and vegetables. William Gorman, UK Tea Council executive chairman, said: "We provided the ASA with almost 100 independent scientific research papers and yet they still turned us down despite acknowledging that the antioxidants in tea are absorbed into the body. "Many of the papers we presented used the same methodology to show that fruit and veg are good for you, but the ASA effectively told us we'd have had to run clinical trials, normally reserved for medical drugs." The UK Tea Council represents tea-producing countries plus UK tea packing and distribution firms.